Mushrooms have been represented in traditional Mexican cooking for many many years from modest quesadillas via traditional soups up to the most sophisticated delicacies. The general knowledge that we have about mushrooms precisely relates to this culinary custom even though they also arouse curiosity when we think about their use in some ceremonial practices in certain religions where hallucinogenic mushrooms have received honor and adoration in some countries of the world, amongst which is our country. However the peculiarity of these organisms and the amazing abundance in nature causes them to be of scientific interest in the field of biodiversity. Mushrooms are a group of organisms that scientists have segregated from the plant kingdom and put into a new kingdom called fungus due to their very particular characteristics. These organisms include microscopic forms such as mildew and yeast up to quite voluminous forms such as the so-called tree mushrooms which grow on the tree trunks. They are widely distributed over the whole planet and prosper in almost any climate: tropical, sub-tropical, mild and cold, that is in all those environments whose temperatures lie between 4º C and 60º C and where the indispensable elements for their existence are found: organic material and water. Mushrooms are classified according to their size into micro myketos and macro myketos. The first ones are mildew and yeast, microscopic organisms used in the production of alcoholic beverages such as pulque (fermented maguey), wine and tepache (fermented pineapple). They are the ones that ferment the sugars of the sap of the maguey, the musts of the grapes and the pulp of the pineapples and convert them into alcohol. The delicious French and Italian cheeses such as camembert and gorgonzola are produced through a controlled growth of mildews. Yeasts intervene in the production of bread and beer and in medicine various species of mildews are used to obtain antibiotics. 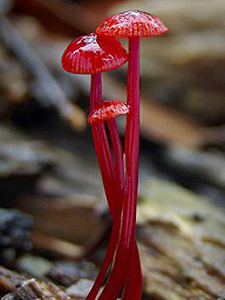 The macroscopic mushrooms or macro myketos are important due to their economic, social and ecological value. The scarce studies carried out on the ecological aspect of mushrooms allow us to see that their potential is huge. Doctor Gaston Guzman, a researcher with more than 40 years in the field of mycology points out that of the “140 thousand species of mushrooms estimated to live in Mexico only 4.5% are known”. Veracruz is the state with the greatest wealth in mushrooms and where most of the studies have been carried out. The teacher Luis Villareal from the College of Post-graduates affirms that “mushrooms are a structural and functional element of the forest’s eco-systems…(….) and they could set themselves up as a potential and alternative resource in the integral and sustainable handling of the forests”. In addition they contribute with more than 3% to the national non-timber forest production. From there stems the importance of encouraging studies that contribute to generating an ample knowledge about the potential of the country’s mycology. 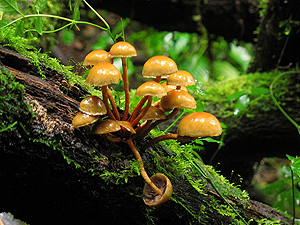 According to Villareal 205 species of mushrooms in Mexico are eatable and the majority grows in coniferous forests, in tropical forests and in mesophyll mountain forests. The majority of these species are connected with the roots of the trees in a association called micorrízica (mushroom-root) where both the tree and the mushroom receive benefits. 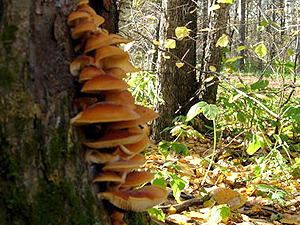 The tree-mushroom relationship implies an exchange of nutrients: the mushroom receives the nutritional substances which are beneficial for this growth from the cells of the roots of the tree whereas the tree achieves an increase of the absorption surface of its roots and it becomes more resistant against plagues and toxic substances present in the soil. 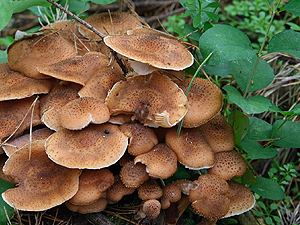 There are eatable species of mushrooms such as Armillaria mellea and Armillariella polymyces which are parasite species that attack and rot the roots of evergreen oaks, of almond trees and citrus trees. Other eatable species corresponding to the scientific genus of Pleurotus and Lentinus destroy the wood and abound in humid trunks cast in the forest or in sawmills and lumberyards. The use of macroscopic mushrooms as medicinal products is very ample. Doctor Guzman has registered around 50 important Mexican species to which native groups have attributed 36 healing properties. Amongst them are anti-colic, fast scar healing, digestive, anti-asthmatic and anti-epileptic actions. 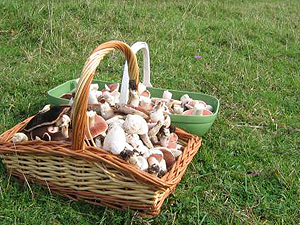 The eatable wild Mexican mushrooms are very well accepted in the national and international markets. Therefore the demand tends to increase. This is reflected on one hand in new companies arising that invest in the purchase of advanced technology for the cultivation of mushrooms since many of the eatable species (especially the parasite species and those that live on decomposing trunks) could be cultivated on industrial and agricultural waste. Agaricus bisporus and Pleurotus ostreatus, known as mushrooms and setas are species cultivated in Mexico very successfully for quite some time. Note: The publication of this article is possible thanks to the authorization of Prof. Fabio German Cupul Magaña, author of the books “Tales of natural history in Vallarta – University of Guadalajara” (Relatos de la historia natural vallartense – Universidad de Guadalajara) and “Natural environment: Selection of essays of scientific disclosure – Coastal University Center of the University of Guadalajara”. (Ambiente natural: Selección de ensayos de divulgación científica – Centro Universitario de La Costa Universidad de Guadalajara).